Sydney Long was an Australian painter and etcher of decorative landscapes. Sydney Long (20 August 1871 – 23 January 1955) was an Australian artist. A painter and etcher of decorative landscapes, Sydney Long studied under Julian Ashton at the NSW Art Society, and became Ashton’s star pupil and protégé. 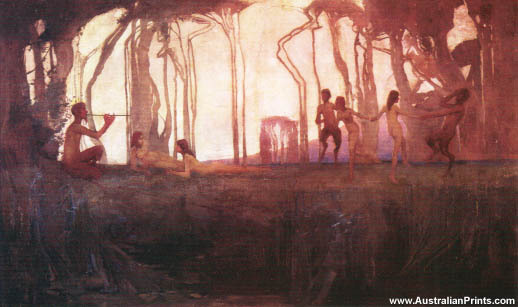 In 1907 he became Ashton’s partner and co-teacher at the Sydney Art. At the age of 19, Long was thrust headlong into fame and notoriety by the purchase of his idyllic figures in landscape painting, ‘Tranquil Waters’, by the NSW Gallery. A controversy ensued that brought the young artist valuable publicity. Long left Australia for London in 1910 to continue his studies of painting and etching at various art institutions. In 1920 his skill and artist were recognised by his election to the Associateship of the Royal Society of Painters, Etchers and Engravers. In 1925 he returned to Sydney to a very successful career as a painter and etcher. Long’s success was institutionalised by his election as trustee of the NSW Gallery in 1933. He was twice the winner of the prestigious Wynne Prize for landscape in 1938 and 1940. Artist information page for Sydney Long. This article uses material from the Wikipedia article Sydney Long, which is released under the Creative Commons Attribution-Share-Alike License 3.0.